Broadford Close, Ballinteer, Dublin / Tralee, Kerry who was a former member of ESBRSA Head Office Committee and ex Distribution Department and Transport Depot. Patrick (Joe) McCann, (Broadford Close, Ballinteer, Dublin 16 and formerly Tralee, Co. Kerry) peacefully in the loving care of the staff at St. Vincent’s University Hospital, Dublin. Loving husband of the late Veronica, sadly missed by his loving sons Brendan and David , daughter Ruth, sister-in-law Bridget, son-in-law Trevor, grandchildren Hannah, Adam, Tara and Shane, nieces, nephews, extended family, relatives and friends. Joe will be reposing at Masseys Funeral Home, Eden Centre, Grange Road,Rathfarnham from 5.00 pm to 7.00 pm on Thursday evening with removal Friday to Church of St. John the Evangelist, Ballinteer arriving for 11.00 am Funeral Mass followed by interment in Shanganagh Cemetery. 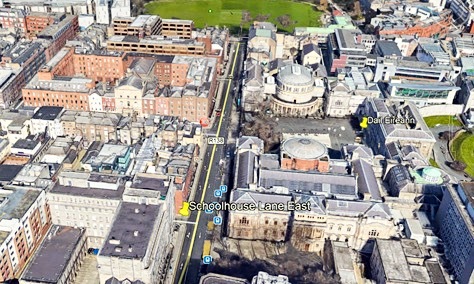 ESBRSA DÁIL PROTEST MOLESWORTH ST. The National Executive Committee (NEC) sends it’s appreciation and thanks to all who attended today’s protest at Dáil Éireann. Particular thanks to the fifteen branches nationwide who were represented at the protest, those who traveled long distances and those whose attendance was very burdensome. · Peacefully on the 25th March 2019. Retired ESB. Ballykeeran, Athlone and late of Carlingford, Co. Louth. Predeceased by his brothers Peadar, Kevin and Antion. Sadly missed by his loving wife Kay, son Hector, daughters Grainne, Nina and Cathy, brother Seamus and sister Bernadette, grandchildren, nephews, nieces, in-laws, relatives and many friends. Reposing at his residence on Tuesday evening from 4pm until 8pm. Requiem Mass on Wednesday in Our Lady’s Queen of Peace Church, Coosan at 12-00noon followed by burial afterwards in Coosan Cemetery. Family flowers only please, donations, if desired, in lieu to South Westmeath Hospice. 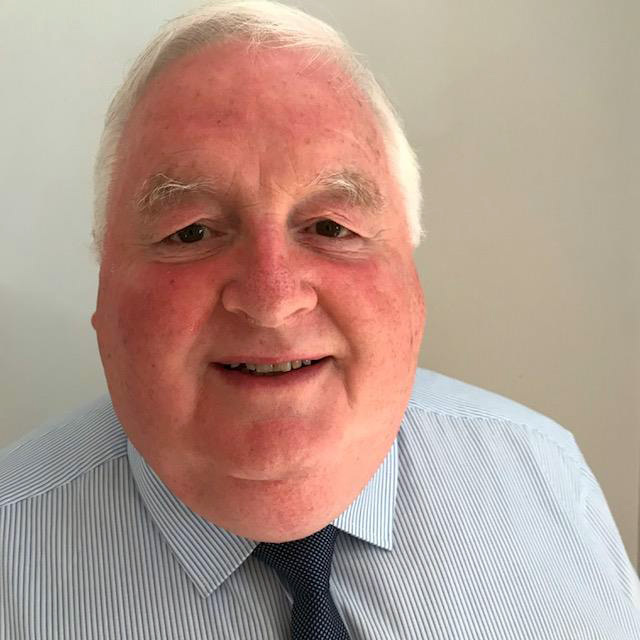 · The death has occurred of John Belotti, Milestown, Castlebellingham, (late of ESB Head Office, Dublin), suddenly at home. John, beloved son of the late Alfredo and Bridget. Sadly missed by his heartbroken sisters Ursula, Elena, Anna, Clara, Maria and Teresa, his cherished friend Margaret Sexton, brothers-in-law, nieces, nephews, grandnieces, grandnephews, cousin Roberto, extended family, neighbours and friends. Reposing at Connors Funeral Home, Dunleer on Wednesday from 3pm until 8pm. Removal on Thursday morning at 10.30am to Saint Mary’s Church, Kilsaran arriving for Funeral Mass at 11am. Burial afterwards in adjoining cemetery. The GPC (General Purposes Committee) has decided that another Protest should follow quickly on the last one in order to keep up the momentum gained. This Protest will be held on Wednesday 27th March at 12 noon outside Dail Eireann in Kildare Street. ESB Pensioners, as majority stakeholders in ESB DB Pension Scheme (70%), have no representation or arbitration procedures with ESB Management or ESB Pension Scheme Trustees. Both ESB & the Trustees have refused to engage with RSA on any of the issues raised in the letter handed in to ESB at our last protest. This Protest will be on the same scale as the previous or bigger. We are contacting members via their Branch Secretaries and by email. Please pass on the message to those members not on email. This venue is much more convenient than ESB Gateway and can be accessed quite easily by public transport. The Luas Green line stops in Dawson Street and the 145 bus from Heuston station will leave you at Kildare Street. We are also suggesting that you contact your local TD’s and inform them that you will be protesting outside Dail Eireann on 27th March in support of pensioner’s rights. There will be local elections this year and who know’s what will happen after Brexit, maybe a general election? We will be wearing our high- viz yellow vests again so don’t forget to bring yours. Placards will be available on the day. “This means that the problems which were of such concern to the Trustees have now been removed and therefore there is now no question of reducing the benefits of the Scheme or making any change in the current practice of increasing pensions in line with ESB wage increases.” !!! Below is an extract summary of a report produced by ESB in 1996 titled History and Development of the Superannuation Scheme. The third bullet point shows that Government intervention in our pension fund resulted in further liabilities for the fund. Further to the January 3rd update this extract from the 2008 Pension Fund Annual Report confirms operation of the Pension Promise. 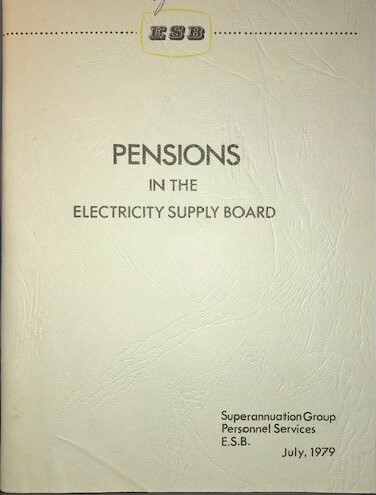 The photos here are of a pension booklet issued by Superannuation Group, Personnel Services, E.S.B.in July 1979 to staff. ESB, Will you honour the Pension Promise ? Reposing at Fordes Funeral Home, Old Waterpark, Carrigaline. Removal Monday (11th) at 7.00pm to St. Mary’s Church, Passage West. Requiem Mass Tuesday (12th) at 2.00pm, funeral afterwards to St. Mary’s Cemetery, Passage West. Family flowers only please donations in lieu to Marymount. Thanks to Michael Hughes for the photo. There will be a guest speaker to give, what I understand, is a very informative and entertaining talk on the Bridges of the Liffey and the history associated with them. This is a departure from some of the more serious subject matters covered at previous social events. The committee believe that this topic will be of interest to our members. Spouses/ partners are welcome and refreshments will be provided. The ESB Retired Staff Association wants the traditional linking of pensions and employee salaries to be restored. 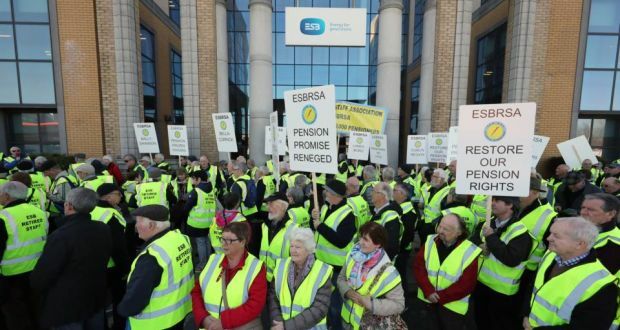 ESB pensioners have taken part in a protest calling for a pension increase. Retired workers demonstrated outside ESB’s headquarters in Dublin’s East Wall to demonstrate their anger and frustration over a 10-year freeze in increases to their pension payments. Matt Kelly, national executive assistant secretary of the association, said they were driven to the protest because the ESB has said it will only negotiate with individuals, not with the association. “We want the ESB to negotiate with us and to recognise it has a responsibility,” Mr Kelly said. “It made a pension promise to the pensioners when we were employed that the increase in current salaries would be reflected in our pensions. He added: “We are looking for our pensions to be brought in line with current staff, which was the way for 40 years when I was employed by ESB. In 2010, an agreement was made between the unions and ESB employees that ESB would no longer fund any deficit in the pension fund. Mr Kelly, 74, said the agreement was made to the detriment of pensioners. “We had no say, no vote in this agreement but it has resulted in our pension being frozen,” he said. More than 9,000 pensioners are affected. Last August, the association submitted a claim for a 7.7% increase. Mr Kelly said the claim was to match what serving employees were awarded between 2015-2017. Prior to 2010, pensioners were awarded pension increases in line with salary increases awarded to staff, a practice that had been maintained for more than 40 years. Mr Kelly said they contributed to the pension fund so they consider it their money. “We regard it as deferred payment. We contributed. The employer also contributed, but it’s our money,” he said. ……………………………………………..Meanwhile, up to 9,000 ESB pensioners on guaranteed pensions are demanding a 7pc hike in their payments to keep pace with staff pay rises. 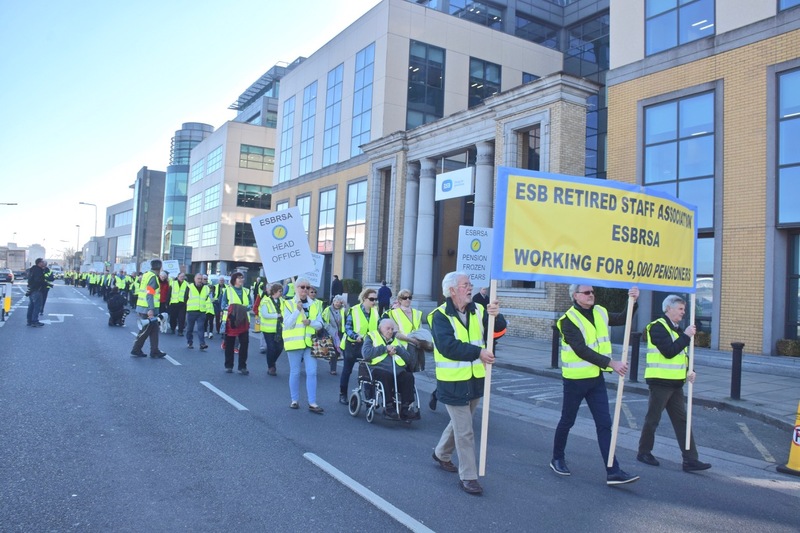 The ESB Retired Staff Association’s 15 branches held a protest at the company’s head office yesterday calling for an end to a ten year pension freeze.It wants a traditional link between pensions and ESB employees’ salaries restored. It says this was the practice for over 40 years until 2010. The pensioner said they are in dispute with the ESB and the trustees of the company’s defined benefit pension scheme. The association submitted a claim for a 7.7pc increase last August, in line with what it says staff received between 2015 and 2017. However, it said the ESB and ESB Defined Benefit Pension Fund rejected the claim. It said the ESB pension fund had an actuarial surplus of €58m in 2017, in a statement. 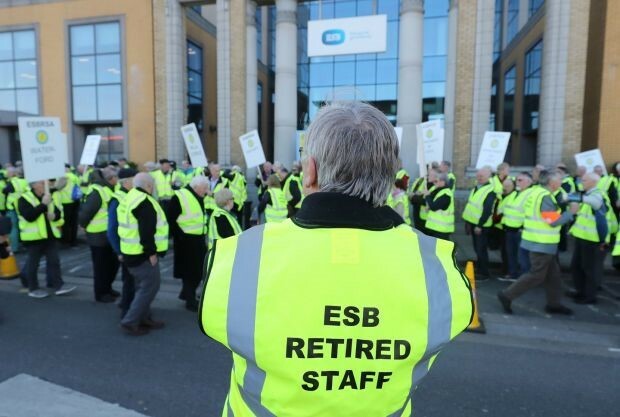 Hundreds of retired ESB workers marched on the company’s Dublin headquarters on Tuesday demanding pension increases they say were stripped from them unfairly almost 10 years ago. They are just one strand of thousands of former semi-State employees who feel cast aside by changes to their pension schemes. Those affected say they are struggling, trapped between the realities of a frozen income and the rising cost of living, and with nobody to fight their corner. 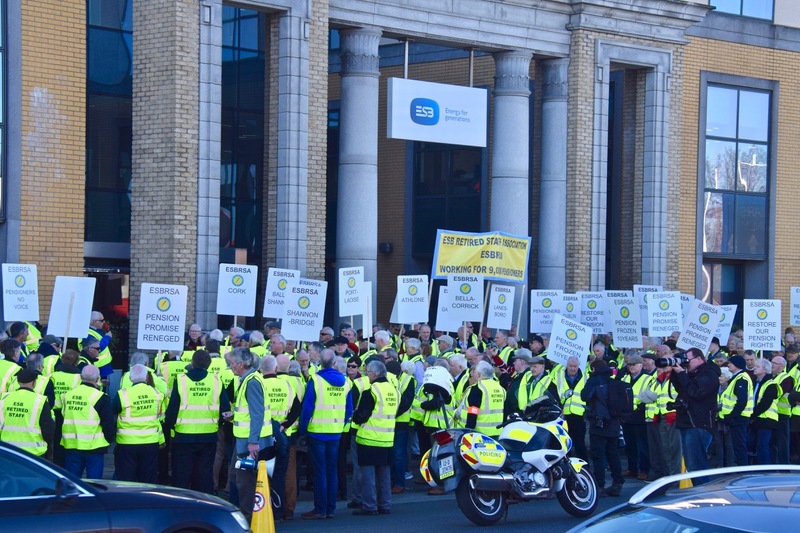 The ESB Retired Staff Association, which organised the march, explained how its members became trapped by the terms of a 2010 pension agreement negotiated between management and unions without their input, and that essentially imposed an ongoing freeze in payment increases. 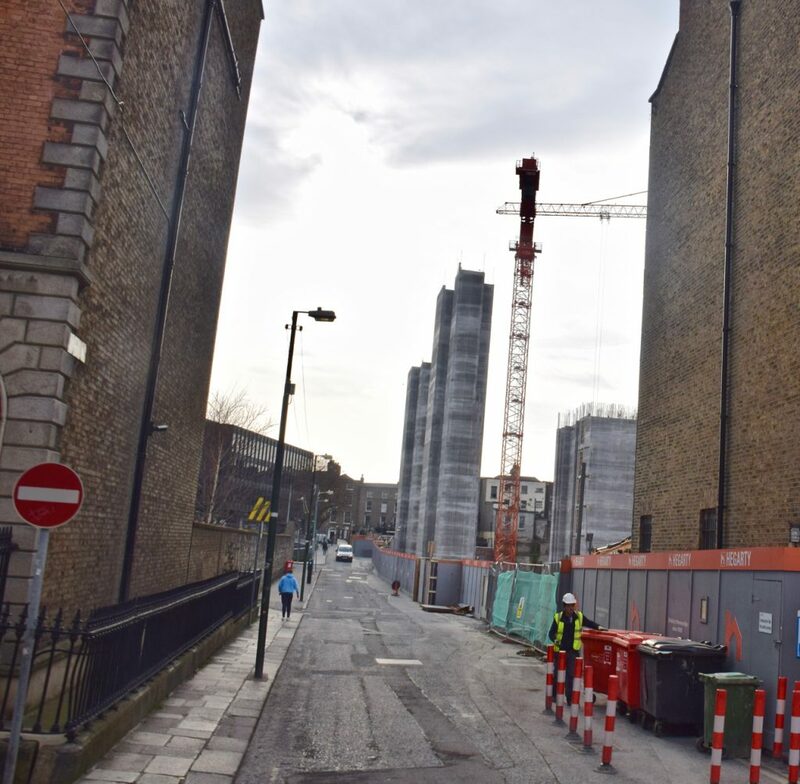 A claim it submitted last year for a 7.7 per cent increase – reflecting what they say existing staff have received between 2015 and 2017 – was “rejected” by the ESB and the pension fund, it said. There is a general sense among workers that they have no outlet to raise their concerns or options other than a prohibitively expensive legal action. This apparent frustration was set out at an Oireachtas Committee last October during which representatives of the ESB, RTÉ and Bord na Móna retirees said they had tried, unsuccessfully, to discuss the issue with the Equality Tribunal, the ombudsman, through industrial relations procedures and with trustees of funds. On Tuesday, demonstrators from around the country wore yellow high-vis vests outside the company’s East Wall headquarters as a handful of employees looked on. The ESB said the pension scheme “is managed and operated independently” and declined to comment. Its trustees, who the retired workers say have flatly refused to engage, could not be reached for comment. The ESB group of unions, who the workers say negotiated the 2010 agreement, said nobody was available for comment. However, it is this sense of firmly shut doors that is fuelling the workers’ determination to protest, particularly in the run up to a general election. He told them that each person who turned up – organisers put the figure at 500 – represented five who could not. Marcella Doyle, who retired 15 years ago, said she has spent the majority of that time on a fixed income with rising living costs, including a 160 per cent bump in health insurance. “As far as I am concerned, the ESB don’t know we are here. We don’t exist,” she shrugged. A woman called Dorry from Co Wexford explained how her late husband who retired almost a quarter of a century ago had worked as an on-call engineer fixing electrical faults as people phoned their house with pleas for assistance. Dorry continued to answer the phone when he went out. 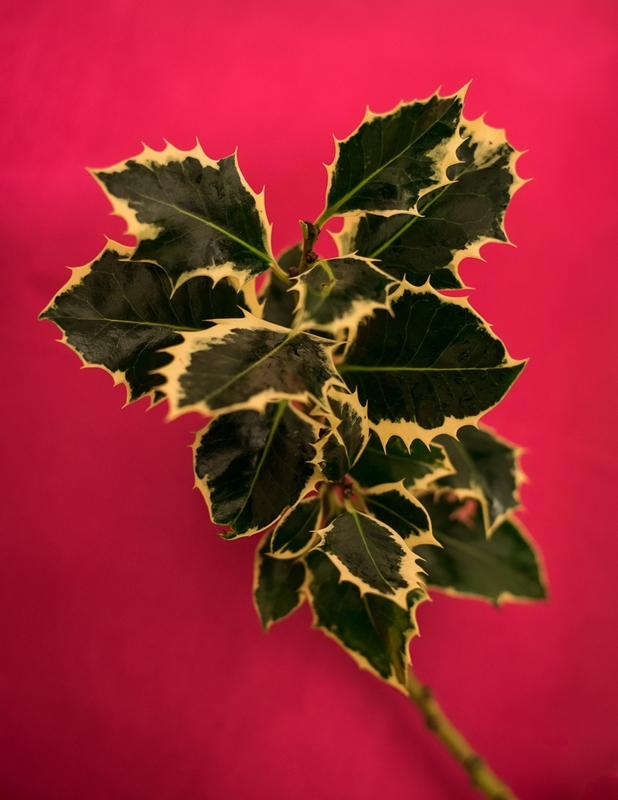 “For the first 15 years of our marriage we didn’t have a Christmas dinner on Christmas day because my husband was out working,” she said, adding that today she is “fighting to live”. This report was given to ESB by ESB Retired Staff Association on 5th. February 2019. 5. The Pension Scheme has been in balance since 2011 with an ongoing solvency level of 98% in 2011 up to 101% in 2017. 6. The assumptions underlying the ongoing valuation depend on the judgement of the actuary and hence pensioners’ incomes depend directly on this judgement. OUR THANKS TO ALL WHO TOOK PART IN TODAY’S PROTEST AT ESB HO EAST WALL ROAD IN SUPPORT OF OUR PENSION CLAIM. SPECIAL THANKS TO THE BRANCHES WHO TRAVELED FROM ALL BRANCHES NATION WIDE! WE WILL TOMORROW PUBLISH THE REPORT COMMISSIONED FROM TRIDENT CONSULTING ON THE ESB DEFINED BENEFIT SCHEME WHICH WAS SUBMITTED TO ESB. More Photos have been added to the Gallery ! Venue: ESB HQ at Gateway, East Wall Road, Dublin 3. ESBRSA National Executive Committee (NEC) have organised a Protest March in Support of a pension increase. The National Executive Committee lodged a claim against both ESB and Trustees of the Pension Fund for a 7.7% increase in August 2018 which has been rejected by both ESB & Trustees. This was to match what serving employees were awarded between 2015 – 2017. ESB Group of Unions are currently in negotiations with ESB for a further round of pay increases for employees. Prior to 2010, pensioners were always awarded pension increases in line with salary increases awarded to staff, a practice that had been maintained for more than 40 years up to 2010. We are asking All 15 Branches of ESBRSA to participate in this protest to demonstrate our anger and frustration at the way pensioners have been treated since 2010. The quickest and shortest route to ESB HQ at Gateway by Public Transport is by the 130 bus from Lower Abbey Street, opposite Abbey Theatre. The 130 bus runs every 10 minutes and you get off the bus at stop no. 519, Annesley Bridge, Fairview and the Gateway HQ is only about a 5 minute-walk down East Wall Road. The 29A bus, also from Lower Abbey Street will bring you to Annesley Bridge, but is not as frequent as the 130. An ESBRSA Protest Marshal will be at the bus stop in Abbey Street to assist members. He will wear a Hi Viz yellow vest with ESB Retired Staff printed on the back and will wear a “Marshal” armband. ESB Gateway is also accessible by DART via Clontarf Station and by LUAS to the Point Depot with a 20-minute walk to Gateway. There is a Starbucks, LIDL & McDonalds very close to ESB HQ where refreshments and toilet facilities are available. There will be designated spokespersons in the event of a media presence and also designated Marshals to ensure member safety. High Visibility Vests will be given to all ESBRSA participants. The protest is expected to last for 1 hour Approx. Please show your support by turning out in large numbers for this protest !!! Spouses & Partners are Welcome too!! Retirement Notice, Frank McManus, Smart Energy Services. Frank will be celebrating his departure from ESB on Friday 22nd February, in Kennedy’s of Westland Row, D2. Commencing from 6p.m. with the intention of continuing on to the small hours. Frank started his career in Head Office, in research & development, working in the area of energy conservation and he was implicit in building 6 energy efficient houses in Kilcock in the 80’s. He then moved to key account management in customer services, working in the commercial and industrial sectors and now finishing up in Electric Ireland working in the R&D area of data analytics in Smart Energy Services. Frank would love you to join him on the night, for an evening of refreshments and light banter. Time/Date: Friday, 22nd February from 6p.m. Ollie Brogan, Managing Director, ESB International will be retiring from the company shortly. 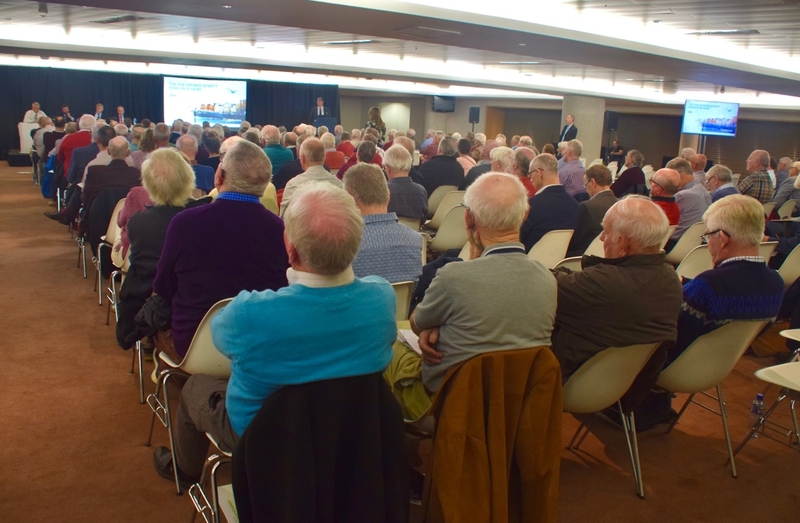 As you may be aware, Savvi Credit Union’s AGM was held on Friday evening last in The Convention Centre Dublin. During the AGM, a reduction in Death Benefit Insurance (DBI) and Life Savings Insurance (LS) was announced and discussed. Due to the reduction in the Credit Union’s income, principally due to investment market returns and the corresponding drop in the surplus generated, the Board of Directors is regrettably and very reluctantly having to implement a reduction in the level of DBI and LS cover for members. The maximum amount of share insurance will reduce from €7,700 to €3,000 and will be subject to the usual terms and conditions. This reduction has not yet been implemented – members will be notified of the change in writing over the next couple of weeks and the letter will state when the changes will come into effect. There is no change to the Loan Protection Insurance (LP) and cover will stay the same where members up to the age of 70 have their loan balances insured. This has been a very hard decision for the Board to take and was only done after months of exhaustive efforts to see if there were viable alternatives. As noted above, the reason for the reduction is that it is no longer financially feasible for the Credit Union to continue to provide cover given the associated costs. It is obviously not something that the Board wants to do, however, as the elected representatives of the Credit Union as voted for by the members, it is the responsibility of the Board to ensure that Savvi Credit Union can continue to operate and remain viably sustainable in the future for all members. The National Executive Committee (NEC) wishes all members a peaceful and enjoyable Christmas. With regret we inform you of the death of Christopher (Noel) Reynolds , Portmarnock and late of E.S.B., 20th December 2018. Peacefully in the care of Beaumont Hospital, surrounded by his loving family. Beloved husband of Christina. Very sadly missed by his loving wife, daughter Susan, son Derek, son-in-law Davide, daughter-in-law Sebnem, granddaughter Maddalena, sister Olive, nieces, nephews, relatives, neighbours and friends. House private. Reposing in Staffords Funeral Home, Strand Road, Portmarnock on Wednesday, 26th December, from 3pm to 5pm. Removal to St. Anne’s Church, Portmarnock on Thursday, 27th December, for 10am Funeral Mass, followed by cremation in Dardistown Crematorium. Family flowers only please. Donations, if desired, to the Irish Cancer Society. With regret we inform you of the death of John Roche, Mountrath Rd., Portlaoise on Dec 18th. “I would encourage those who would benefit from this technology to volunteer for the research panel so that they can provide the necessary feedback and input to ensure the app meets their needs,” the Minister said. The coverage of the presentations starts at approx. 44 minutes into the video. at Committee Room 4 on Thursday October 25th. The rise that fortnightly paid pensioners got today is the Trustees agreed paltry increase for 2018 of 1/5th. of one per cent</span including backmoney to 1st January 2018. That’s equivalent of someone on the gross average pension of €26,000 a year getting an increase of €52 a year or €1/week – that’s what the 1/5th. of one per cent amounts to! It’s the first increase in ten years! At MPF request we provide the information below. individual letter addressed to the member, advising them of their policy number. attending a Hospital or Medical Professional or when making a claim to the office. MPF will be using policy numbers going forward and staff numbers will be phased out. office at 061-430561, e-mail at mpf@esb.ie or in writing to the office. MPF will reissue policy details. You do not have to contact the office when you receive this letter. A group representing ESB retirees and deferred pensioners has served a claim for a 7.7% pension increase on both ESB and the ESB Defined Benefit pension fund, adding that it is “extremely likely” that a new funding proposal will be required next year. The claim is included in a letter dated September 10, from the ESB Retired Staff Association (RSA) to the secretary of the ESB group of unions, James Nolan. 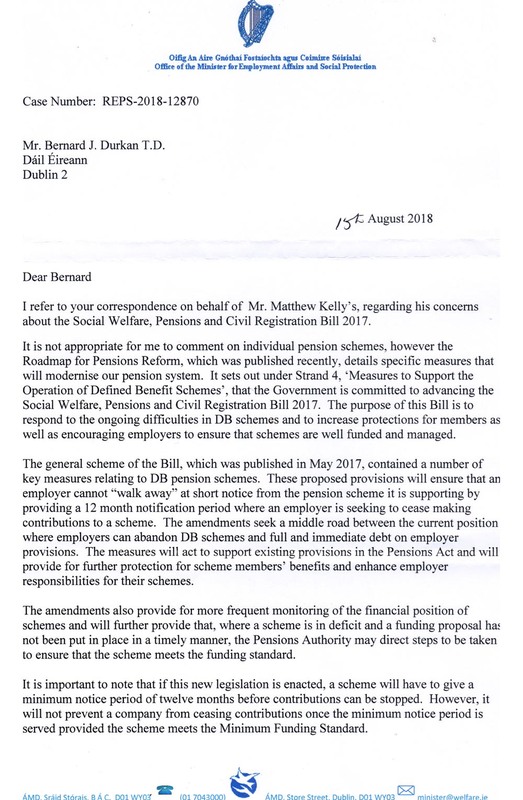 The letter seeks to draw the attention of the union group to a statement made by the Trustees of the DB Pension Fund in their report entitled, ‘Annual Summary Report 2017 for the ESB DB Scheme’, in respect of the minimum funding standard (MFS). Quoting the Trustees, the letter continues: “The scheme will then be subject to the new MFS regime which includes a requirement to provide a risk reserve. It is extremely likely that a new Funding Proposal will be required in 2019 from ESB and the Trustees to address this risk reserve. Agreeing a new funding proposal will be an onerous challenge”. The RSA says it is important that the “ESB’s future liabilities to the Scheme” – as the letter puts it – should be fully recognised in any MFS proposals put by ESB and the Trustees to the Pensions Authority from 2019. It also wants an open and transparent process, including a role for the RSA in the interests of its members as well as all scheme members. The RSA tells the union group that it views the MFS issue as particularly crucial in view of what it describes as the “yawning gap” between the ESB statement in its 2017 annual report and earlier annual reports, concerning the company’s obligations to the pension scheme, “along with its stated intention of not making further contributions”. The association’s letter also draws attention to the unions’ statements, recorded in a letter from the group of unions on December 6, 2013, addressed to ESB board members, as well as a subsequent letter by solicitors, Byrne Wallace, to the ESB chairman (March 3, 2014), “notwithstanding the LRC letter to the parties” of December 8, 2013. The LRC letter refers to the LRC (now the WRC) settlement of a 2013 row over how the scheme was to be described in annual reports and how future funding deficits might be addressed. 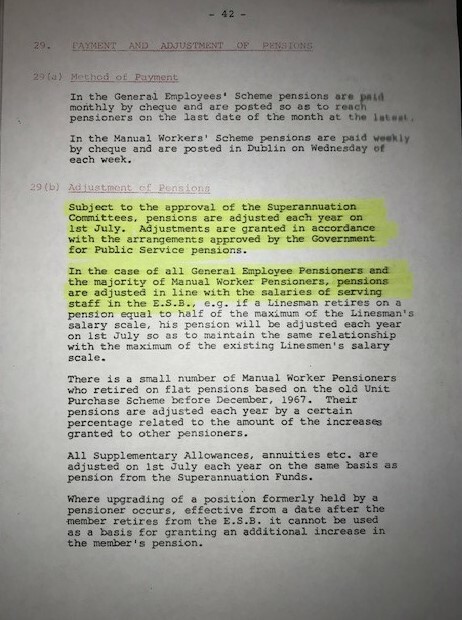 That IR settlement, based on a letter of recommendation by the LRC, was agreed just before Christmas 2013, after the unions – led at that time by former group secretary, Brendan Ogle – had threatened industrial action over how the pension scheme was described in the ESB annual accounts. The Commission recommended that company’s accounts “should state clearly that the scheme is a defined benefit scheme” and that should an actuarial deficit arise in the future, the parties “will engage with each other in line with agreements and normal practice to address that issue”. In other words, any future problem was to be managed through the industrial relations process, as pension deficits in ESB were in the past. Meanwhile, the scheme was once again to be described in the accounts – as the unions demanded – as a defined benefit scheme. The description of the scheme had been changed in the 2010 accounts. However, in a separate development – after the successful LRC intervention – it was argued by the unions that a 1995 amendment to the 1942 Act, which governs the ESB pension scheme, appeared to suggest that in regard to any future deficit, the trustees can decide – on the advice of the actuary – to instruct the company to fix such a shortfall. IRN observed at the time that this amendment “may provide the unions with an added weapon in any future battle”. But the ESB strongly refuted this view, pointing out that the amendment merely enabled necessary changes to the scheme at that time, including specific payments related to the then ground-breaking tripartite cost and competitiveness review (CCR), a broad partnership-based agreement that followed a damaging 5-day strike in 1991. Apart from some uncertainty over the 1995 amendment issue, the LRC-brokered outcome was seen as “an industrial relations solution to the problem of how to go about plugging any future deficit that might arise … (it) gives comfort to union members, that while the scheme is solvent as things stand, should a problem arise down the line, a formal written LRC document recommits both parties to what had been a tradition of joint responsibility”. “Whenever deficits arise in the scheme the established practice is that the parties engage with each other to agree arrangements to deal with such deficits. The parties are fully agreed that should deficits arise in the scheme at any time in the future they will engage together in line with normal practice to seek agreement in relation to that matter,” the LRC said. The Commission also observed that the accounts should clarify that no actuarial deficit “currently exists in the scheme and that in those circumstances neither party has an intention to adjust their level of contribution to the scheme at this time”. The ESB said that the resolution protected the financial strength of ESB – “there will be no additional liabilities on ESB’s balance sheet”. It also recognised ESB’s “existing obligations under the terms of the scheme and there will be no change to the accounting treatment of the scheme in the company’s financial statements as a result”. What the RSA letter to the group of unions raises is how a new funding proposal might be handled, given that it believes this to be an “extremely likely” challenge, as the Trustees have pointed out. IRN understands that the union side has been advised, informally, that the company intends to try and resolve any future pension fund problems through “normal practice” – which means direct engagement – as recommended by the LRC/WRC. But how the issue is handled will also be a test of what the unions secured through their threat of action prior to the Commission’s successful intervention in late 2013. What may give the retirees or the union side some cause for concern, however, is the lack of any legal certainty regarding this IR approach. The LRC’s wording is open to interpretation, for example, where the Commission says: “The Accounts should clearly state that the accounting for the scheme in the accounts is on the basis of compliance with the agreed infrastructure of the scheme, the parties commitments to each other and all appropriate standards, regulations and agreements”. This seeming ambiguity will be tested, if and when a new funding proposal is required. Meanwhile, in making their bid for a 7.7% pension increase on both the ESB and the pension fund, the retirees’ association point out that the most recent pension increase was paid on January 1, 2009. They say that the state pension has increased since that time by 9% – or by €1,040 a year – and that staff in ESB have been awarded “three pay rounds aggregating 7.7% in the period 2015 to 2017”. 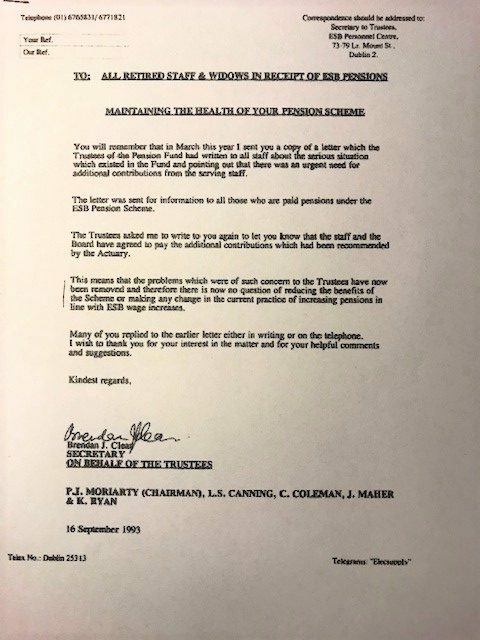 The letter goes on to remind the unions, that “you are also likely aware that the Pension Fund has undertaken to pay a pension ‘increase’ shortly of one-fifth of one per cent worth, on average, €53 per pensioner per year in accordance with the terms of the 2010 Agreement, an outcome that Group hardly envisaged in 2010”. The RSA’s case may carry little industrial weight, due to the simple fact they lack any real bargaining power. It has forwarded its case to the general secretary of ICTU, Patricia King, and IRN understands that the matter is being considered by Congress’s Liam Berney. However, given that the RSA broadly represents some 9,000 pensioners and ‘deferreds’, their case could attract political attention, especially with a general election an ever-present threat. It is not a number to be sneezed at, and the Minister for Social Protection, Regina Doherty, will be aware of the RSA’s case. 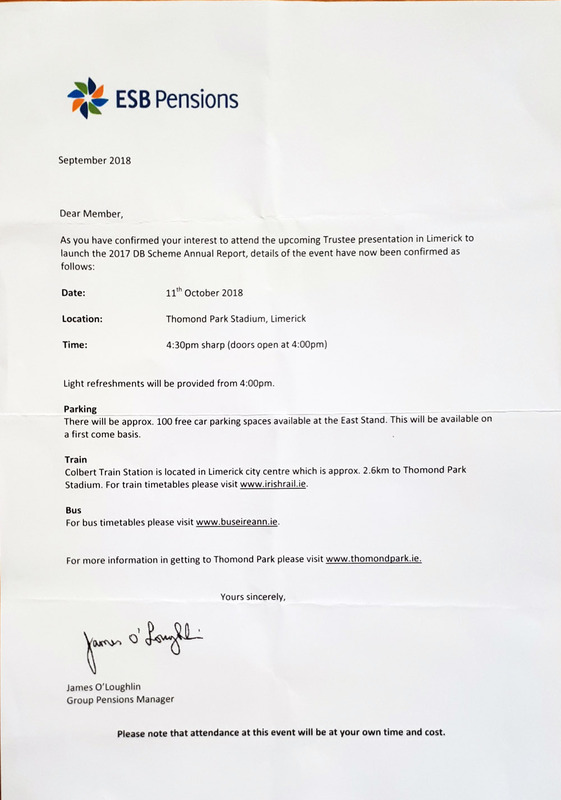 The Trustees of the Scheme are holding a meeting in the AVIVA STADIUM (LANSDOWNE ROAD) Dublin on Tuesday 9th October (More details below). This is an opportunity to support your Association and to let the Trustees and ESB Management know your feelings on ESB’s refusal to continue its traditional support for the Scheme. This is an opportunity to support your Association and to let the Trustees and ESB Management know your feelings on ESB’s refusal to continue its traditional support for the Scheme. For a pensioner on the average pension (€26,644) this means €53 per year or €1 per week. The vast majority of you do not get a state pension. Government and ESB ensured you could not contribute for a state pension because you were contributing to a secure indexed-to-pay-increases state occupational pension scheme. has increased by 9% or €1,040 per year or €20 per week. Staff have received pay rounds in 2015, 2016, and 2017 amounting to 7.7% . ESBRSA has served a claim on ESB and the pension fund for a 7.7% increase. There will be 100 free car parking spaces located at the West End of the stadium which will be available on a first come basis. Entrance to this via Lansdowne Lane. There is also paid parking located just past the main stadium entrance. The car park is charged at €2.00 per hour, to a maximum of €10.00. The nearest train station is Lansdowne Road which is a short walk to the Aviva Stadium. There are a number of buses which stop close to the Aviva Stadium. Please visit www.dublinbus.ie for further details. For more information in getting to the Aviva Stadium please visit www.avivastadium.ie. The Internal Market held on 24 September 2018 has now been completed. Market Price) and this is the price that will be paid to all successful sellers. partially successful and sold approximately 28% of the shares offered. successful sellers will be issued on 8 October 2018. The ESOP Trustee will be writing to all participants in due course. 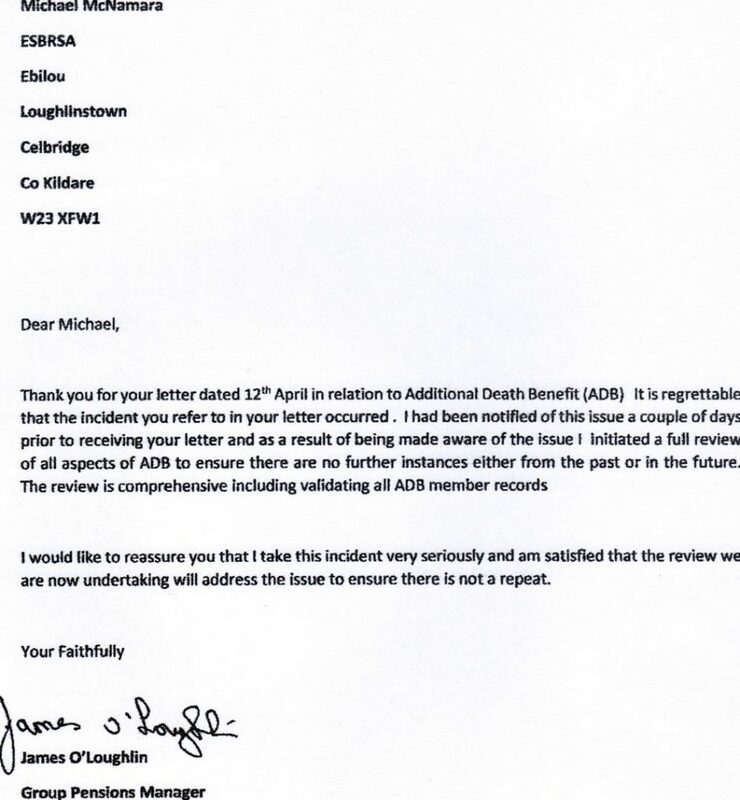 ESBRSA sent the letter below to ESB Group of Unions as dated. pensioners of ESB, all of whom are stake holders in ESB DB Pension Scheme just as current employee members of the scheme are stakeholders. I write to bring your attention to a statement made by the Trustees of our DB Pension Fund in their report “Annual Summary Report 2017 For The ESB DB Pension Scheme” in respect of the Minimum Funding Standard (MFS). 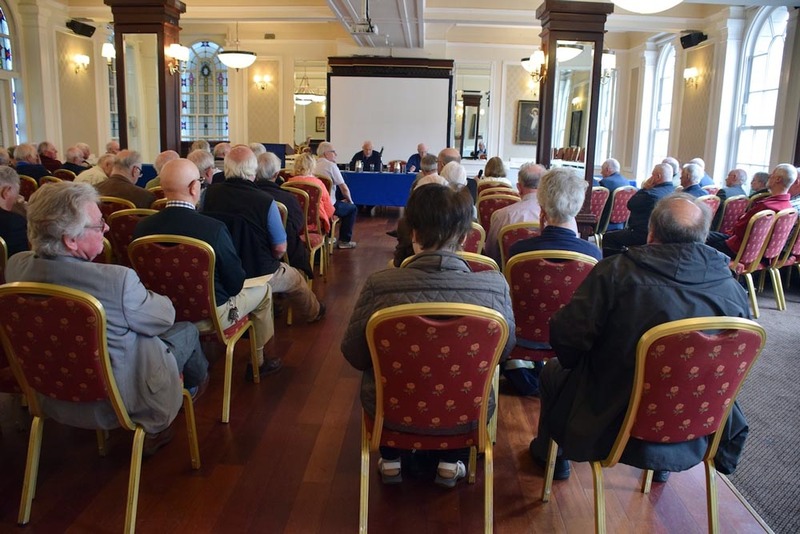 This retired Staff Association regards it as vitally important, for both existing pensioners and for existing employee members both now and when they retire, that ESB’s future liabilities to the Scheme are properly and fully recognised in any MFS proposals put by ESB and the Trustees to the Pensions Authority from 2019. RSA is seeking an open and transparent process including representation from ESB Retired Staff Association in the development of any such proposals in the interests of all Scheme members. Our Association views this MFS issue as particularly critical in view of the yawning gap between the ESB statement in its 2017 Annual Report (Ref 1) (and earlier Annual Reports) , concerning its obligations to the pension scheme along with its stated intention of not making further contributions, and your Group’s statements, recorded in your letter to ESB board members dated 16th Dec 2013 and Byrne and Wallace letter to ESB Chairman dated 3rd March 2014 on behalf of your Group, notwithstanding the LRC letter to the parties of 8th Dec 2013.
to forego the traditional indexing. If your Group were to embrace this idea it could be a useful starting point for trying to secure a return to the traditional indexing we were all promised. Finally, I wish to advise you that this Association has served a claim for a 7.7% pension increase against both ESB and ESB DB Pension fund, jointly and severally. The most recent pension increase paid was on 1st Jan 2009; the state pension has increased since then by 9% or €1,040 per annum; and staff have been awarded 3 pay rounds aggregating to 7.7% in the period 2015 to 2017. You are also likely aware that the Pension Fund has undertaken to pay a pension “increase” shortly of one fifth of one percent worth, on average, €53 per pensioner per year in accordance with the terms of the 2010 Agreement, an outcome that your Group hardly envisaged in 2010. Byrne & Wallace Letter to ESB 3rd March 2014.  Mr. Janes Nolan, Secretary, ESB GoU, 41 Merrion Sq., Dublin 2.  Mr Paddy Kavanagh, Connect Trade Union, ESB Section, 6 Gardiner Row, Dublin 1.  Richie Browne, Unite the Union, ESB Section, 55-56 Middle Abbey Street, Dublin 1.  Ms Patricia King, General Secretary, ICTU, 31-32Parnell St. Dublin 1. “The obligations to the Scheme reflected in ESB’s financial statements have been determined in accordance with IAS 19 Employee Benefits. Given that the Scheme is not a typical “balance of costs” DB Scheme (where the employer is liable to pay the balance of contributions to fund benefits) the obligations to be reflected in the financial statements require the exercise of judgement. Should a deficit arise, the Company, as noted above, is obliged to consult with the parties to the Scheme. A solicitor will speak on Enduring Power of Attorney, Wills and Fair Deal topics.There will be refreshments and music to follow. 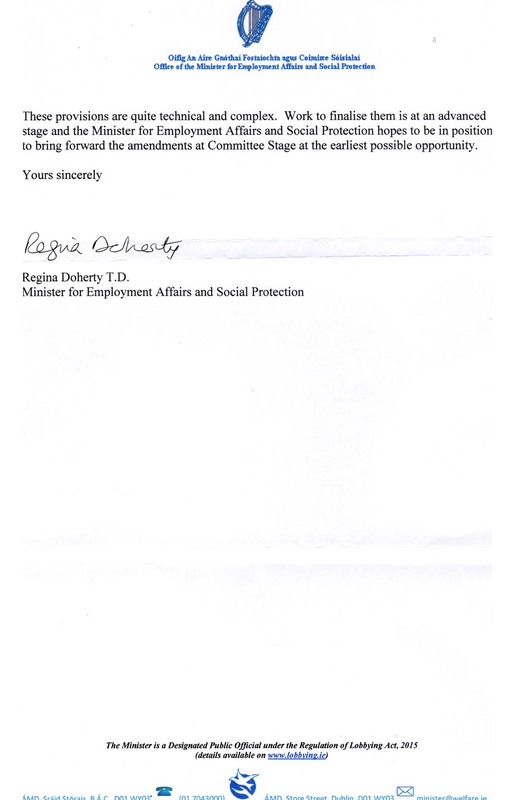 We thank Bernard Durkan TD who obtained the letter below from Regina Doherty TD Minister for Employment Affairs and Social Protection. Members of the ESB Defined Benefit Scheme will have received the Annual Report Summary 2017 in the post recently. There will be two member’s event meetings this year, one in Dublin and one in Limerick. We urge as many members as possible to attend these events. We note that the Committee has decided to award a pension increase of one fifth of one per cent in 2018. This is a derisory, token increase, to pensioners who have had no increase for nearly ten years. candidates for their commitment to our Fund. Following the count of votes for election of ESB Medical Provident Fund Trustees the results are posted below. The ESBRSA recommended candidate got a very respectable 1,120 votes but was short by 105 votes of being elected. Tony sends his thanks to all who voted and supported him in his first candidacy. He also sends congratulations to the successful elected Trustees and best wishes to the other candidates. 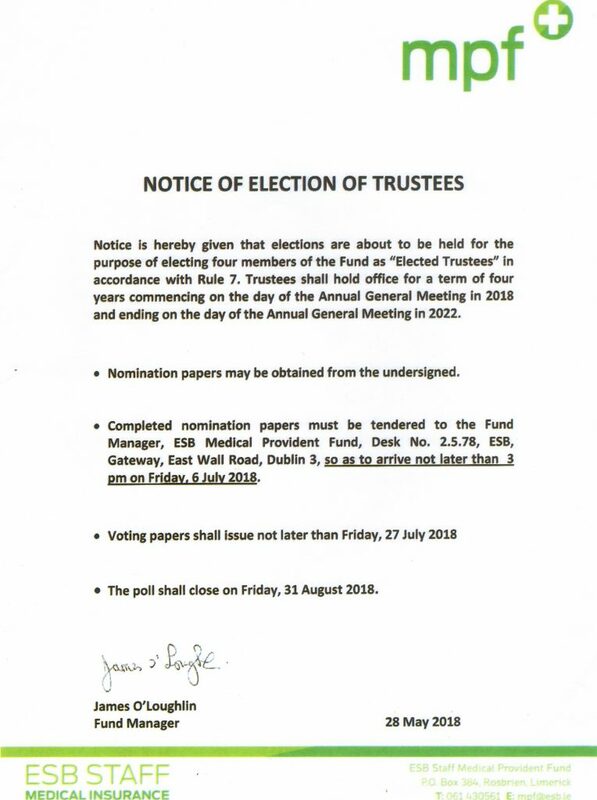 The closing date for the return of voting papers for the MPF Trustee Election 2018 is Tuesday 28th August 2018. Please also note the ESBRSA Reccomendation to vote for Tony Smyth in the upcoming Medical Provident Fund (MPF) Election. The Trustee of the ESB ESOT intends to operate an Internal Market on 24 September 2018 (the Market Day). Further information and confirmation of the Market Day will issue to participants. ESBRSA urges all staff and pensioners to vote for Tony Smyth in the upcoming Medical Provident Fund (MPF) Election. Tony’s candidacy is supported by ESBRSA. • I am very concerned at the increasing cost of medical insurance and level of cover for families and particularly for retired staff. • As Shop Steward during my career in ESB, I have experience in representing ESB Staff for many years and will make every effort to optimize ESB MPF for the benefit of all of its members. • The latest MPF Trustees’ Report and Financial Statements (2016) show reserves of over 40 Million Euro which have been built up over the contributing lifetimes of our members. These funds need intense scrutiny as to how to be best used in the interests of the members who paid for them. issues facing elderly staff and those nearing retirement. I would work, in particular, to build a closer bond between members and Trustees and to increase the number of elected members on the Board of Trustees. ESBRSA is affiliated to the Irish Senior Citizens Parliament (ISCP). The link below will bring you to the Report of the ISCP Annual Parliament News Issue dated June 2018.
will be of interest to any staff member who contributed for the optional ADB scheme. In 1988 ESB General Employees’ Superannuation Scheme introduced the Additional Death Benefit Lump Sum Scheme. (the Scheme) (ADB). Members of the ESB Pension Scheme had the option of paying an additional contribution in return for an additional lump sum payable on death. The additional benefit, including standard benefits under the ESB Pension Scheme provided a death benefit of up to four times pensionable salary on death before age 55, reducing each year up to age 60. On death after age 60, if the member was retired, a benefit of 20% of actual pensionable salary at age 60 would be payable to the member’s estate. This benefit at age 60 was increased to 30% circa 2008. It has come to ESBRSA’s attention that Scheme members (or their Estate), who were members of the ADB Scheme, are not being notified of the benefit payable under the ADB Scheme in the event of their death. In one such case a widow of an staff member who died in July, 2017 was never informed of her late husband’s entitlement to the 30% ADB at the time of his death. It was a chance meeting and conversation with an RSA member within the last month or so that prompted her to contact ESB Pensions about it in March 2018. She has since been informed that her husband had been a member of the ADB Scheme and has only received a cheque for the appropriate amount within the last week. This begs the question as to how many other members of the ADB Scheme have passed away and their Estates have not received their entitlement to this benefit. I’m sure that there are also many pensioners still living, who are members of the ADB Scheme and are not aware of their entitlement to this benefit. their benefit, to write to their spouse (or next of kin) with a cheque for the appropriate amount of benefit due. This is a very serious matter for members of the ADB Scheme and I trust that you will treat it with the urgency that it deserves. ESBRSA will be publicizing the details of the Scheme by way of its Branch network and through our website. I look forward to hearing from you with confirmation of actions taken to resolve this matter. At MPF request the following notice is published on the website. Lower Abbey Street, Dublin, on Tuesday 22nd May 2018 at 2.15 pm. The Branch Committee hopes that as many members as possible will attend.  CURRENT PENSION LEVY STATUS AND PENSION INCREASE.  LACK OF COMMUNICATION FROM PENSION FUND TRUSTEES.  COMPARISON OF MPF SUBSCRIPTIONS WITH OTHER INSURERS. 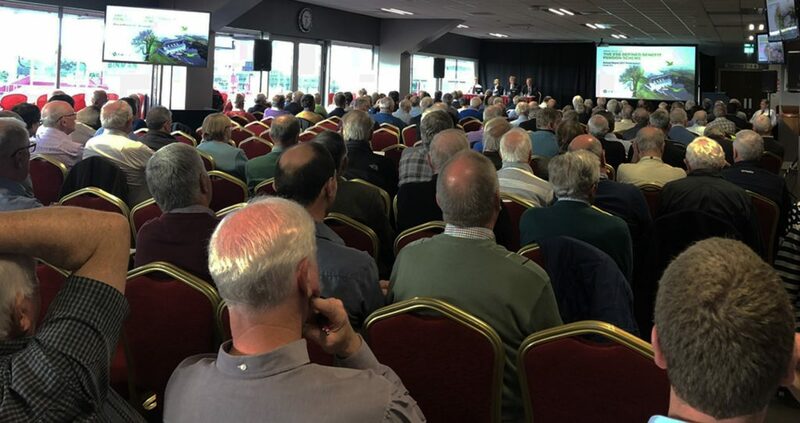 The following letters addressed to Chairman of Trustees, ESB Pension Scheme, and copied to all Trustees and members of the Superannuation Committee, are now displayed on the website in order to inform the RSA membership of the range of issues that the Pension Fund Trustees have yet to address following their meeting in Croke Park on 12th September 2017 attended by almost 500 members from many parts of the country. This meeting came about as a result of sustained pressure on Pension Scheme Management and Trustees by ESBRSA to address the range of issues outlined in the two letters. The letters are self-explanatory and ESBRSA continue to follow up with the Trustees for a response to the issues raised. I refer to my very comprehensive letter to you dated 19th September 2017 which issued following the meeting in Croke Park on 12th September 2017. To date I have not received a response to the issues raised in that letter. I now wish to address one particular issue i.e. that of a pension increase, or the lack thereof, for pensioners since January 2009. It is unconscionable that pensioners be denied an increase in their Pensions any longer given the current climate in the service sector and industry in general and the wage increases that have been awarded recently, 2.5% per annum being the norm for most sectors. With an annual pensions payroll cost of circa €200 million, the cost to the Fund of a 2.5% pension increase would be a minimal €5 Million approx. “Institute a process whereby future changes in pension rates of payment are explicitly linked to changes in the consumer price index and average wages”. The use of CPI alone is not an appropriate measure for determining whether a pension increase should be granted or not. This is also borne out by the fact that the State Pension has increased dramatically and well above the cost of living index in the last 3 Budgets. 1. The 2010 Pensions arrangement, agreed unilaterally with ESBGoU, has imposed severe hardship on pensioners for the past 9 years, subjecting them to an indefinite pay freeze and breaking the traditional link with salaries. It was not endorsed by All Scheme members. Pensioners had no input to its terms, and most importantly had no vote, even though they represented more that 50% of the Scheme membership at that time? 2. Were the Trustees acting fairly between beneficiaries and in the interests of All beneficiaries in endorsing this Agreement, Do the Trustees believe that this was a fair and equitable Agreement in that context? 3. 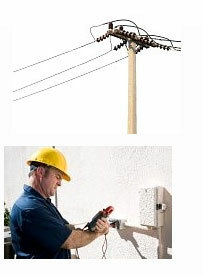 There was no built-in review mechanism in this arrangement with the ESBGoU. It needs to be revisited in the context of the aforementioned facts. 4. The actuarial assumptions used by the Scheme Actuary in the 2014 Actuarial Valuation were very much exposed as overstated and inaccurate, particularly in the case of a 1.75% assumption for pension increases and mortality assumptions. 6. Even if one looks at 9-year period of a prolonged pension freeze, the CPI increased by 5.1% from 2010 to 2016 inclusive. 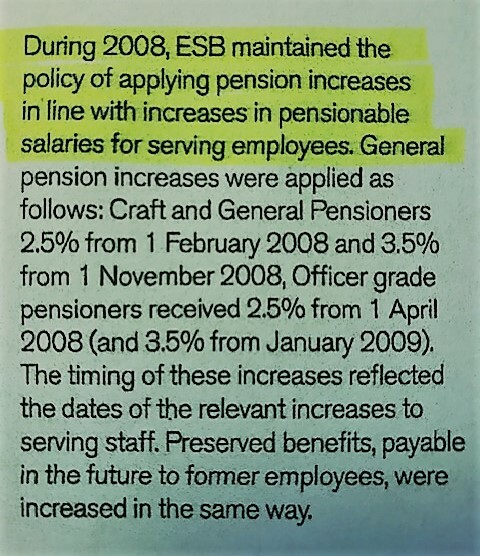 This is apart from the fact that ESB staff have been granted salary increases of 7.5% over a 3-year period (despite no increase in CPI), and traditionally pension increases have followed the staff salary increases. 7. When one examines the Funding Proposal submitted to the Pensions Authority in 2012 to meet the Minimum Funding Standard shortfall, the weak argument for the non-inclusion of a pension escalation rate is the condition of passing a solvency test. Ironically, one of the main the reasons for not passing the test is the inclusion of an assumption of 1.75% for pension increases. RSA’s actuary clearly stated that an assumption for pension increases of 1.75% per annum on an ongoing basis, without having allowed for one single year’s increase inflates Scheme Liabilities by more than €700 million. Yet the Scheme actuary saw fit to include in the MFS Funding Proposal assumptions of 4% for salary inflation, 3% for CARE revaluation and 2% for price inflation. His assumptions and arguments for both the MFS and ongoing actuarial valuations are full of contradictions. ESBRSA would welcome an opportunity to meet with you and your fellow Trustees to discuss this letter and the issues raised in my previous letter of 19th September 2017. I would like to take this opportunity, on behalf of ESBRSA, to thank the Trustees for organising the meeting on 12th September 2017 and all those who made presentations on the night. I would also like to congratulate the Trustees on the investment returns for 2016 and the manner in which the Fund Investments have been de-risked and diversified in recent years. There were many questions asked during the Q & A session and other issues were not raised or expanded on due to the time constraints. I would like also to take this opportunity to expand on some of those issues and to ask questions that were not raised on the night. The decision to hold a meeting at 7 pm in Dublin was unfair to members living and working in many parts of the country. Pensioners from various country locations did not attend for that reason. However, despite the timing and location of the meeting many travelled in numbers from Bellacorick, Waterford, Cork, Lanesboro, Galway and Portlaoise. The Pensions Manager was asked whether consideration was given to holding a meeting at 1 or 2 pm to facilitate pensioners traveling from those locations on public transport. I would suggest that due consideration be given for any future events. I’m sure the Trustees were left in no doubt as to the feelings of the general membership at that meeting on the 12th September 2017 – one of great frustration and anger at the way pensioners have been treated by Pension Scheme management. Yet pensioners behaved with great dignity, respect and a measured response on the night. A direct question regarding the 2010 Pensions Agreement was asked on the night and no answer was given viz., were the Trustees acting fairly between beneficiaries and in the interests of All beneficiaries in endorsing this Agreement, given that pensioners had no input to its terms, and most importantly had no vote, even though they represented more that 50% of the Scheme membership at that time? Do the Trustees believe that this was a fair and equitable Agreement in that context? This Arrangement with ESBGoU has severely disadvantaged pensioners as a group, subjecting which means all pensioners have suffered a reduction in the real value of their pensions up to 15 %, and greater in some cases. 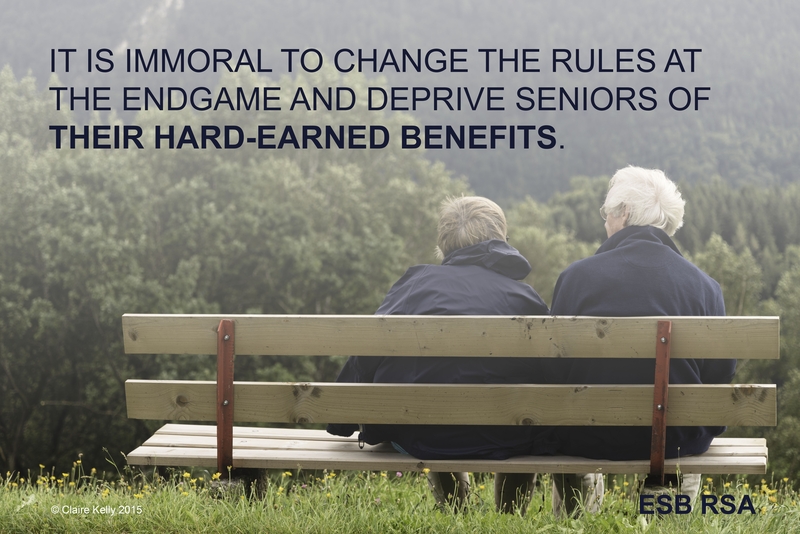 The absence of a built-in review mechanism in the 2010 proposals will further disadvantage pensioners. This Arrangement unilaterally changed their pension arrangements that had existed for decades. ESB, also unilaterally closed the DB Scheme circa 2009, cutting off the flow of new contributions and thereby abandoning the traditional pensions model. Have you as Trustees challenged ESB, as sponsoring employer, on this course of action, reneging on its responsibilities to support the Scheme and failing to honour the employment contracts of all existing staff and pensioners? We note that the Auditor stated in ESB 2016 Annual Report that All Pension Scheme members accepted 2010 Pensions Agreement. This is inaccurate, pensioners did not have a vote so less than 50% of Scheme members (serving staff only) were allowed to vote on that Agreement and only a minority of those actually voted. Those who voted to accept the Agreement were very much a minority of the total Scheme membership. Have the Trustees challenged ESB on that inaccurate statement? 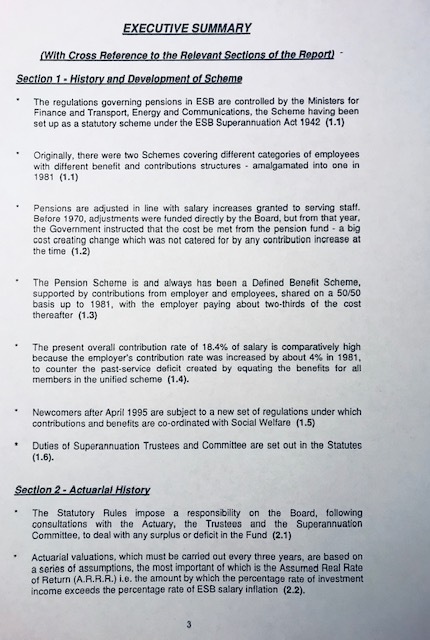 of this report by ESBRSA’s actuary so the Pensions Manager presented it to the Committee himself. a) Best reflects the actuarial position of the fund. b) Is in line with best practice. d) Is consistent with the rules of the scheme and current governance structures. ESBRSA’s actuary stated that an assumption for pension increases of 1.75% per annum on an ongoing basis, without having allowed for one single year’s increase inflates Scheme Liabilities by more than €700 million. In the 2011 valuation the assumption for pension increases was 1.9%, these assumptions being made in a period of a prolonged pension freeze. The assumptions for mortality rates are greater than those recommended by the Society of Actuaries. Such notional assumptions for each year that the Fund will exist as a ‘going concern’ into the future will have a dramatic effect on liabilities. If one was to exclude such generous assumptions, the Fund would have had significant surpluses in the past and will into the future. ESBRSA were disappointed that the Pension Fund Actuary from Mercer’s, Liam Quigley, did not defend his assumptions when they were challenged on the night. ESBRSA would also welcome an opportunity to discuss the actuarial valuation with you and are willing to provide a copy of our actuary’s report for discussion. You were quite emphatic in your response to the call from members for a pension increase with, fund insolvency, MFS funding deficit, no increase in CPI, given as reasons for not granting an increase. Many pensioners, particularly those on low pensions have suffered hardship with a considerable reduction in their nett income due to increased medical, motor and home insurance costs, USC charges and property tax affecting their fixed incomes. CPI is not an appropriate measure for determining whether a pension increase should be granted or not as many of the above measures are not included in it. However, when one looks at the period of a prolonged pension freeze, the CPI increased by 5.1% from 2010 to 2016 inclusive. In addition to the aforementioned charges pensioners have suffered a further real reduction in their pensions of 5.1%..They should be compensated for this. ESB staff have been granted salary increases of 7.5% over a 3-year period (despite no increase in CPI), and traditionally pension increases have followed the staff salary increases. You denied any link between staff salary and pensions, whereas ESBRSA would argue that pensions were always linked to salaries, and they were not party to any negotiations, nor did they agree or vote on any changes to custom and practice that existed for decades. With the cost of paying pension benefits running at €200 million annually, a 2% pension increase would only cost the fund an additional €4 million, very affordable, given the grossly overstated actuarial assumptions as outlined in the previous paragraph. Minimum Funding Standard (MFS) Valuation. It was acknowledged by the Scheme Actuary, and if I’m not mistaken, also by you, that the MFS is not an appropriate method of valuation for the ESB DB Scheme, given that it is highly unlikely that the Scheme will wind up. This method of valuation grossly overstates Scheme liabilities, particularly the highly inflated cost of buying annuities. There is an extremely limited market for annuities thus the inflated cost. This makes it extremely difficult for the Fund to stay on track with its funding proposal. It must be seen as a priority for Pension Scheme Management to take all necessary steps to obtain an exemption from this regulatory requirement. What continuing actions are Trustees taking with relevant Government Departments and Bodies like Pensions Authority to ensure that the inappropriate MFS regulatory requirement is removed from ESB DB Pension Scheme? In your 2015 Pension Scheme Report you indicate that a funding proposal was submitted to the Pensions Authority in 2012 which aims to resolve the MFS deficit by end of 2018. 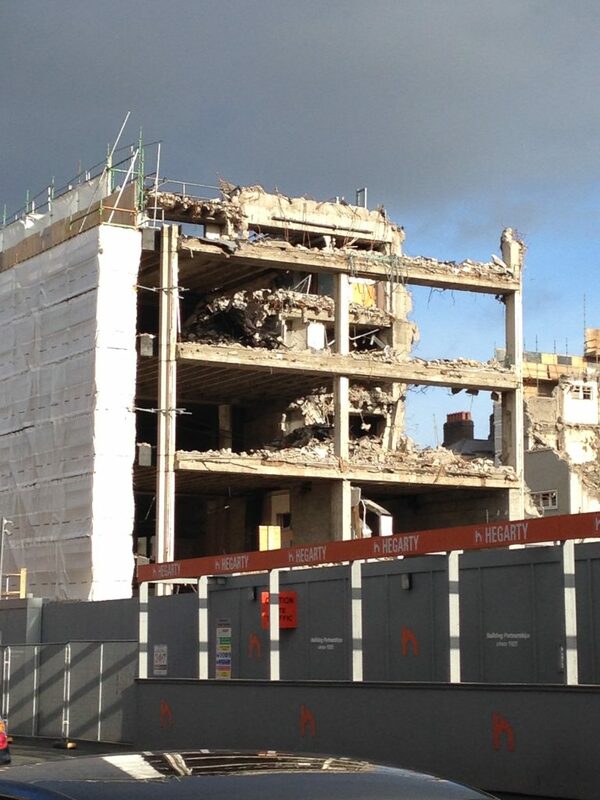 Is there any financial liability on ESB as part of that proposal? Have ESB made any funding commitments as part of that proposal either in the form of additional contributions or the use of Company assets as security contingent on the Scheme failing to meet agreed funding levels? Section 7 (1) b of that Act has been permanently amended and remains on the statute books. Why were the rules of the Pension Scheme not changed to reflect the change in legislation? This wording, I believe, is typical of a “balance of cost scheme” where all risk is borne by the sponsoring employer. In “considering” the above-mentioned legislation, have you, at any stage, in recent years challenged ESB legally or otherwise with regard to their statutory obligation under this legislation? Your answer to this question on the night was most unsatisfactory. You stated that the Trustees took legal advice on this issue and based on this advice you decided to take no action whatsoever. You went to great lengths to remind the meeting that it was the duty of Trustees to act at all times in the interests of All Scheme members. The very fact that you have not challenged ESB on its statutory obligation under the amended 1942 legislation is certainly not, in ESBRSA’s view, acting in the interests of All Scheme members, because certainty on ESB’s statutory obligation would guarantee the security of future Scheme funding. You also went to great lengths to outline the difficulties that the Pension Fund is likely to face in the future so it’s unbelievable that you would not mount a legal challenge on this extremely important issue. It was made very clear to you on September 12th that in the context of ESBRSA’s challenge to your application of the Government Pensions Levy you did not hesitate to engage expensive legal opinion at both the Equality Tribunal and at the Labour Court against some of your own Scheme members. It would also be of particular interest to All Scheme members that you and your fellow Trustees would challenge ESB’s statements in its Annual Reports for the last 5 years that it has no obligation to increase its contributions to the Pension Fund, under any circumstances, in the event of a deficit. This is contrary to ESB statutory obligations under the amended 1942 Act and also another very valid reason to mount a legal challenge in the interests of All the Scheme members. Have the Trustees also challenged ESB on the fact that they have derecognised a €1.6 billion pension liability in the Company accounts for 2010. This amount referred to the Company’s liability for pensions which appeared in the Company accounts for 2009 and was removed in the 2010 accounts. Your answer to a question regarding the abolition of the current levy deduction from pensions was an emphatic “no”. Trustees should continue to seek the appropriate contribution from ESB to the Pension Levy, namely 2:1 ratio, and that this is in the interests of All Pension Scheme members. I would invite the existing Trustees to an independent arbitration for a hearing on the case outside of a legal process. You stated that the levy being currently recovered from pensions was in respect of the levy payments for 2011 & 2012, €36 million approx, and that the deduction was calculated on the basis that it would be for the lifetime of current and future pensioners. You also stated that it would be very unlikely that the levy payments in respect of 2013, 2014 & 2015 would be recovered from pensioners. Your argument in 2013 for applying the recovery of the levy was that the Pension Fund was in a very difficult financial position at that time and that the Fund Actuary advised that the payment of the levy should be cost neutral to the Fund. The Scheme finances have now greatly improved. A further question was asked regarding the treatment of the Government Levy in the Pension Fund accounts, the levy payment being shown as a charge, yet the recovery of the levy was not shown as a separate income stream. Why is the Income Stream from Pensioners for the Pension Levy not shown clearly in the Pension Scheme annual accounts? Based on the scenario that you put forward i.e. that the Pension Scheme will most likely be in existence for another 80 years and that the recovery of the levy from pensioners amounts to €2 million per annum, I believe that the calculation for the recovery of the €36 million payments for 2011& 2012 over the lifetime of the Fund has been grossly overstated as the amount recovered will be well in excess of the €36 Million, possibly up to three times that amount. A full review of the levy recovery needs to be undertaken. 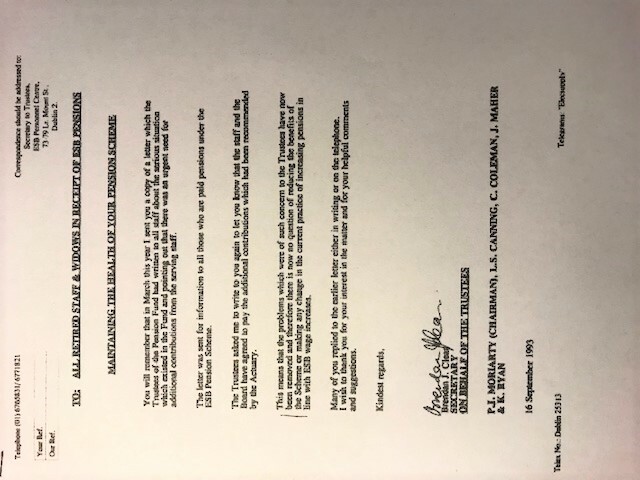 I am now asking you to respond to the issue of joint industrial council recommendations 2354 and 2354(a) issued in 1992 and 1993 dealing with the aftermath of the 1981 comprehensive agreement and the merging of the manual workers and general Superannuation Schemes. “Are you and your fellow Trustees aware of the background to these JIC recommendations and have you challenged the company and ESB GoU on their failure to honour this undertaking”. It was very clearly stated by ESBRSA at the September 12th meeting that the Pension Scheme Governance is not fit for purpose given that almost 70% of members are now either pensioners or deferred pensioners. The changing demographics of the Scheme membership means that that figure of 70% will increase dramatically in the next eight or ten years. The Superannuation Committee is totally unrepresentative of the Scheme membership as only serving staff (30%) are represented by this Committee. This has been acknowledged by the Company. This needs to be addressed without further delay and pensioners need to have representation proportionate to their numbers on both the Trustees and the Superannuation Committee. I disagree with your argument that it is irrelevant whether pensioners have increased representation on the Trustees or not, because when elected, Trustees are required to represent the interests of all members. I would also disagree with your contention that elected Trustees should not liaise with the constituency that elected them. All Trustees, and particularly elected representative Trustees, have a duty to account for their stewardship of the members assets once elected. Why do all Trustees, and particularly elected Trustees, refuse to meet with Pensioner Representatives once elected while continuing to meet with active member representatives and sponsor representatives? Prior to 2010 it was always the case that elected Trustees would meet with either Trade Union or RSA reps. I don’t see why it should be any different now. When are the Trustees going to address the changes necessary to the Pension Scheme Rules to admit pensioner representation on all Governance Committees on a proportionate representation basis given the current and future demographic on the Pension Scheme? Given that you disclaimed any responsibility for the pre-selection or election process for Trustees we will take this issue up with the Company shortly. I trust that you will treat this letter with the importance that it deserves and that you will endeavour to respond to the questions raised. Alternatively, ESBRSA would welcome an opportunity to meet with you and your fellow Trustees to discuss this letter. With regret we inform you of the death of our colleague Tom Shortall, 68 St Brigid’s Square, Portarlington. Prior to retiring Tom worked at Portarlington Generating Station and later at Portlaoise Training Centre. Reposing at his residence on Thursday from 1pm with rosary at 9pm. Removal on Friday at 11am arriving at St Michael,s Church, Portarlington for Requiem Mass at 12 noon. Funeral afterwards to St Michael’s cemetery Portarlington. We have found some information re competition in Health Insurance costs (See the link below). RSA asked that ESB MPF consider freezing subscription increase for 3 years. MPF have committed to revert to RSA – sometime – and the review date of 1st April is not far away. It is to be noted that claims must be submitted within 3 months of treatment being carried out so it would be important for any claims from 28 October 2017 to be submitted by 28 January, 2018.